Green peas are a favorite spring vegetable and are a great addition to a recipe because they contain a high concentration of vitamins and minerals. They also provide the carotenoid phytonutrients, lutein and zeaxanthin, which promote eye health. 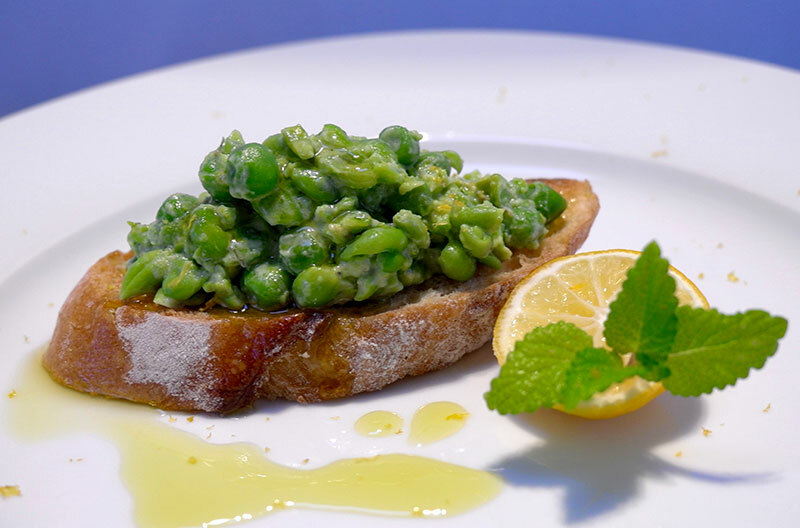 While I like to eat fresh peas directly from the pod, one of my favorite toppings on bruschetta is mashed peas. Remember “bruschetta” is from the Italian verb “bruciare” which means to burn or toast. The toasted bread is really a “carrier” for a multitude of toppings, including mashed peas. When combined with creme fraiche, lemon juice and zest, mint leaves and of course, extra virgin olive oil, you are in for a treat.